It really costs me a lot emotionally to watch myself on-screen. I think of myself, and feel like I’m quite young, and then I look at this old man with the baggy chins and the tired eyes and the receding hairline and all that. 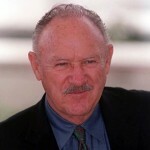 Eugene Allen "Gene" Hackman was born in San Bernardino, California, USA. He is a retired American actor and novelist. In a career that spanned five decades, Hackman has been nominated for five Academy Awards, winning two, including best actor in The French Connection. In addition Hackman has also won three Golden Globes and two BAFTAs. He first came to fame in 1967 with his performance as Buck Barrow in Bonnie and Clyde. He has written two novels include: Payback at Morning Peak and Vermillion. Together with Daniel Lenihan, he has written three historical fiction novels include: Wake of the Perdido Star, Justice for None, and Escape from Andersonville.